ATLANTA - Aug. 16, 2013 - PRLog -- After realizing that over 85% of the girls who attend the organization's programs don't have a father in the home, the Enchanted Closet was inspired to do something to help make a positive difference in their lives. Statistics show that girls growing up in a home without a father are dramatically more vulnerable to societal ills, teen pregnancy, mental, physical and sexual abuse, aggression, poor grades/dropping out of school, suicide, crime, drug usage, and human trafficking. Attorney Ashley Palmer, an Enchanted Closet Youth Empowerment Board Member and Public Defender in Clayton County, GA sees the impacts of youth growing up without a father almost daily. "So many of the crimes that I see as a defense attorney stem from the fact that so many of my clients' fathers were/are missing from their lives, and they are angry and know no other way to express themselves except through violence. The old adage is true, hurt people, hurt people." In addition to these startling statistics, girls without fatherly influences, tend to be more insecure, have lower self-esteem, and are more likely to make harmful decisions than girls growing up with a father in the home. The organization developed CONVERSATIONS with Young Sisters to help reduce these statistics and to provide an opportunity for girls, living in homes with or without fathers, to speak with positive men who help them to focus on gaining greater self-esteem, a more balanced perspective, greater communication and decision making skills. The men provide advice, encouragement, and inspiration. Several positive men in metropolitan Atlanta including a actor/barber-Tony Parker, artist-Charlton "CP the Artist" Palmer, radio show host-Derrick Boazman, educator/ therapist/writer-Michael Frazier, entertainment executives-Torrance Hill and Paris "PK" Kirk, two-time NBA Champion Josh Powell, and others are supporting this effort to mentor girls and be father-figures for the day. Gregory Guy, a plant manager for Goodyear Tire Aviation and a father with two adult daughters, plans to advise girls to learn to love God. He says that, "as a result of loving God, girls will learn to love themselves. As difficult as it may appear, it is called "self esteem" for a reason. No one else should control how you feel about yourself." TJ Austin, a member of the Regional Loss Prevention Team for Publix Super Markets, Inc., would like to encourage girls to see beyond their circumstances. TJ says, "regardless of your living environment or upbringing, the sky is the limit. It's based on how far you want to go. The only person that can stop you from accomplishing your goals is you." 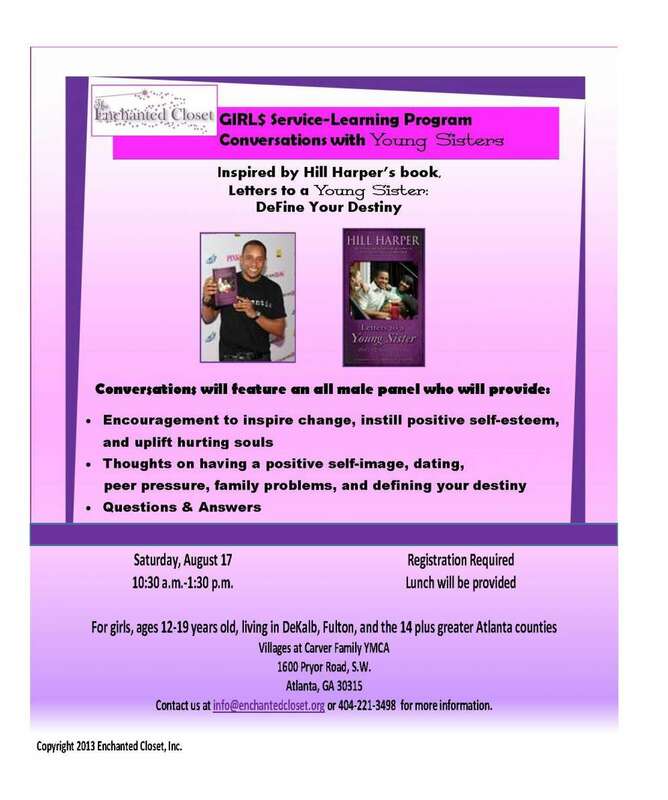 CONVERSATIONS with Young Sisters is a free program for girls 12-19 years old and takes place on Saturday, August 17, 10:30 a.m.-1:30 p.m. at the Villages at Carver Family YMCA. Registration is required. The Enchanted Closet is a volunteer-run, private non-profit service organization whose mission is to physically, mentally, and emotionally outfit Metro Atlanta high school girls from primarily low-income families through programs that prepare them for social and professional milestones. Established in 2003 to distribute prom dresses to girls in metropolitan Atlanta, the organization has provided over 4500 dresses. The Enchanted Closet also offers a GIRL$™ Service-Learning Program throughout the year to increase the self-awareness, self-esteem, and self-sufficiency of girls. For more information, visit the Enchanted Closet web site at http://enchantedcloset.org/.